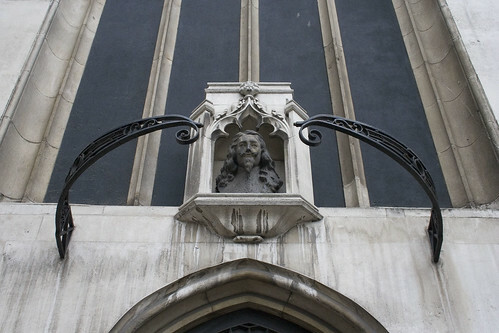 A little curiosity is mounted on the outside wall of St Margaret’s Church next to Westminster Abbey in the form of a lead bust of King Charles I. It sits there above a since blocked off doorway staring at his nemesis across the road, the Houses of Parliament, and specifically, their statue of Oliver Cromwell. Cromwell is depicted in the Parliament grounds with his head bowed in thought, which is widely and often claimed to be him avoiding the gaze from the bust of King Charles I opposite. There’s only one problem with the story of his averted glance. Cromwell’s statue was erected in 1899 to a design by Sir William Thornycroft who was keen on Cromwell and unlikely to approve of a design seen to be ashamed of his history. However, the bust of King Charles I wasn’t donated to the Church by The Society of King Charles the Martyr until 1956. Nearly 60 years later. Oh dear. So there you have a story to show people – point out the bust, then destroy the myth. I am actually curious as to how the myth started as the two items are not that old which seems not long enough for a myth to have built up, especially when the facts are so readily available to anyone wanting to do a bit of research. Myths build up in no time. Research? Research??? I was told that the head signified the church being used as the place where Charles’ body was kept – with head newly attached – after his execution. Another myth? People are obviously just myth-taken. I’ve heard it said that it’s curious that the statue of Cromwell ,,,, known as a “Parliamentarian” ,,,, has it’s back turned on Parliament !!! Most statues in front of buildings tend to look outward. That positioning is not at all unusual. It may be a myth as to the deportment of the statue of Oliver Cromwell, but the reality is that the statue of Oliver Cromwell does actually face the bust of King Charles I and this irony, that it is just the king’s head, cannot be missed! Also the statue of Cromwell was originally intended to go inside the parliament building, not outside it! The bust of Charles was placed with a rye bit of fun being that it might subvert the interpretation of Cromwell’s then long-in-place statue, turning his head-bowed-in-pious-prayer into an ambiguous element, open to interpretation. The myth began with the placement of the bust of Charles, located at a higher (more heavenly?) spot, which then retroactively impacted the context of the Cromwell statue’s pose.